Thanks for stopping by! Our warm and welcoming community encourages you to slow down and enjoy the little things. Teaching by example, we hope to show our children a calmer way of living. Firefly Family Yoga is eager to serve your family's needs. ​Find your inner glow with Firefly Family Yoga! Classes, consultations and workshops are held at our studio space on Main Street in Ridgefield, CT, through special series offered at unique outdoor venues in the Ridgefield area and through private instruction by appointment. We also lead classes at preschools, day care centers and summer camps. 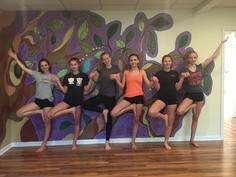 Please contact us for more information about Birthday Parties as well as private yoga! Family Wellness w/ Essential Oils! ​We sell doTERRA essential oils at the studio - the same lovely oils we use during yoga. And we continue to offer free classes every month.